This tutorial shows how to create a simple top-down Web service from a WSDL file. The WSDL file in this scenario calculates the area of an rectangle. Create a dynamic Web project called AreaProj . Import the file AreaService.wsdl into AreaProj/WebContent. 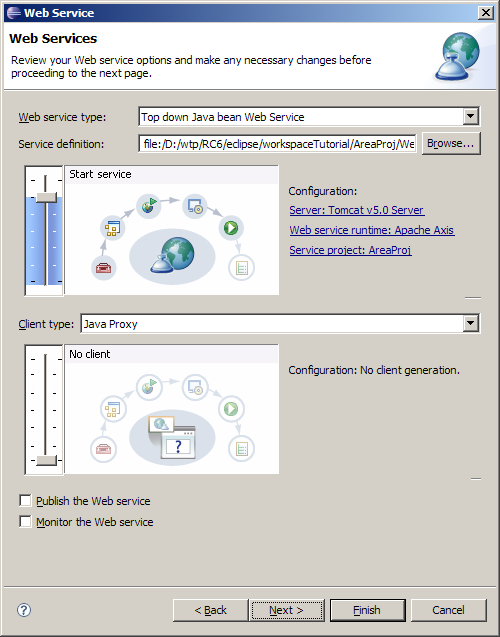 In the Web service type combo, select Top down Java bean Web Service. Move the Service slider to the Start Service position. It will take about one minute for the wizard to assemble the Web service projects, start Apache Tomcat and deploy the projects to Tomcat. Once finished, the Java implementation file AreaServiceSOAPImpl.java will appear in the browser view. Fill in the expression parameters.getHeight()*parameters.getWidth() as the return value for the calculateRectArea method and save the file. Follow the instructions at Creating Web Service Client to create a Web service client that you can then use to test this Web service.